This review originally appeared in the April 1998 issue (#116) of The New York Review of Science Fiction. The fact that Gregory Benford wrote a novel based in Isaac Asimov’s Foundation universe comes as no surprise. In the years before his death, Asimov created a shared universe for a short-lived series of anthologies; presented a series of books spotlighting new writers; allowed Robert Silverberg to expand “Nightfall,” “The Ugly Little Boy,” and “The Bicentennial Man” into full-length novels; and authorized Isaac Asimov’s Robot City, a 12-book series–written by other authors based on his Three Laws of Robotics and set during the time of his robot novels. Benford himself is no stranger to this type of sharecropping; in the mid-eighties he wrote Beyond the Fall of Night a companion piece to Arthur C. Clarke’s Against the Fall of Night. However, the idea to write new novels in the Foundation universe originated not from Benford but from Janet Asimov, Isaac’s widow. Although he declined to take part when initially approached, Benford gradually warmed to the idea, and the result is Foundation’s Fear; the first volume of “The Second Foundation Trilogy,” which will be finished in future installments by David Brin and Greg Bear. 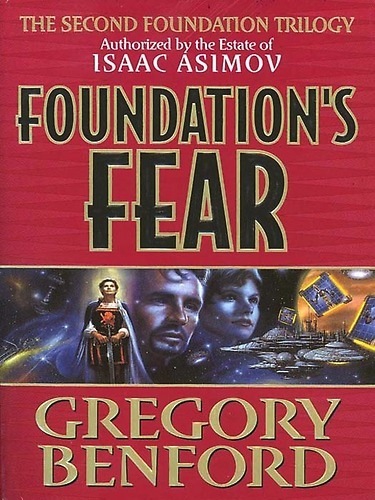 Foundation’s Fear is a much better read than most of its sharecropped predecessors and, as an excellent addition to the series, is better than some of Asimov’s later Foundation novels. The novel takes place during the interval between Parts I and II of Asimov’s Forward the Foundation and describes the events leading up to Hari Seldon’s formal induction as First Minister after his nomination to the post by Emperor Cleon I. Unfortunately, his nomination irritates many of the career politicians in the High Council—most importantly, Betan Lamurk, a council member with his own aspirations of ascending to the position of First Minister. Seldon quickly learns many of the subtle nuances of being a public figure, including how to handle himself in public, how to deal with political adversaries, and how to deal with assassination attempts. Along the way, he continues his efforts to improve and expand his theory of psychohistory as he notices further signs of the empire’s impending collapse. The other main plotline has to do with two sentient, 8,000-year-old computer simulations (called “sims”) of Voltaire and Joan of Arc. At Seldon’s request, their programs are restarted by a computer firm (in defiance of a galactic law which has banned sims for millennia) for two reasons: first, to assist Hari in his research on psychohistory, and second, to take part in a public debate concerning the status of tiktoks, semiautonomous robots that do much of the Empire’s menial labor. However, the programmers in charge of running the programs start augmenting them, and the two sims eventually escape into Trantor’s datanet where they try to continue their existence as best they can. While tackling these issues, Benford adds additional layers and details to Asimov’s description of the Empire, and this is where Benford makes the novel his own rather than an Asimov imitation. Benford’s embellishments to the series include genetically and biotechnically engineered dogs capable of speech and humans with exaggerated physical features; 3D hologrammatic communication devices and displays complete with filters to mask any facial expressions/vocal intonations that might give too much away; brain-expanding data chips embedded in the head; and wormholes linking the galaxy together in combination with the hyperspace ships described in previous Foundation novels. Interestingly, in the case of wormholes, Benford provides a possible explanation for the lack of them in the original series by suggesting that the network became unusable once the Empire began collapsing. In the afterward to the novel, Benford defends his additions by pointing out that Asimov continued to incorporate new scientific ideas as he wrote the later Foundation novels. This self-defense seems unnecessary; trying to imitate Asimov too closely (especially stylistically) would have been a mistake. Benford’s additions help to further distinguish the novel from Asimov’s body of work and make the novel more of a Benford contribution to the series. However, it should not go without saying that this novel cannot be read purely as a Benford novel, nor can one read this expecting something similar to one of Asimov’s novels. Even though Benford doesn’t imitate Asimov, he does simplify his own writing style. Furthermore, on top of the constraints of working in Asimov’s creation, Benford restricts himself in the storyline of the novel as well. By focusing on Hari Seldon and this particular period of his career, Benford loses the ability to place the novel’s main character in real serious danger. Also, anyone familiar with Asimov’s later books knows the final outcome of Hari’s nomination to First Minister. While Benford manages to build some suspenseful moments, you never feel as though Hari might actually become gravely injured, and the outcome is never in doubt. It’s like an episode of Star Trek where no matter how serious the danger seems, you know that Kirk will get out alive and bag the green babe at the end. Another way that Benford helps make the novel his own is by introducing the use of recreational drugs into the Foundation universe. Many in the novel use mood enhancers, drugdrinks, and various stims frequently, including Hari Seldon (albeit only sparingly and without much enthusiasm). There’s even a scene where two minor characters unwind at a bar called “Splashes and Sniffs.” Even though the previous lack of drugs may have been Asimov typically worrying more about the plot than the details of the universe, the overwhelmingly casual use of such drugs does not seem like something Asimov would have considered in such an already well-defined setting—especially in the case of Seldon, whom Asimov, a lifetime teetotaler, viewed as an alter-ego. By introducing such an element, Benford seems to go too far in adapting the universe to his needs. Another problem of Benford’s is a little more troubling. During the course of events, the characters discuss issues that mirror concerns of today, for instance: the deconstructionist theory of science, the merits of new ways to elect people to the High Council (one method in particular is very reminiscent of the method proposed by Lani Guinier for electing congressional representatives a few years back), and the problem of what to do about steadily dropping scores on standardized empire examinations. In the afterward to the novel, Benford wonders whether or not Asimov intended the Empire to represent the United States, and by inserting these discussions, Benford has gone and made that connection. Regardless of whether that was intentional or not, this is probably something that Benford should not have done; first, Asimov never used the series so blatantly to air his own viewpoints, and, second, the possible correlation between the Empire and the U.S. is now too strong to be deniable. This can be one of the inherent dangers of working with someone else’s material. Having said that, Foundation’s Fear is a novel worth reading, something you expect from a writer of Benford’s caliber—and is one that fans of the series should enjoy. Despite some of the aforementioned problems, for the most part Benford maintains the original spirit of the Foundation novels while adapting the universe to fit his needs. With the exception of a couple of scenes focusing on the sims, the book moves at an excellent pace, but, more importantly, Benford achieves the goals he sets out for himself and impressively answers his own questions concerning aspects of Asimov’s empire. In particular, Benford’s examination of psychohistory’s transformation from theory to working tool is mightily impressive; it shows just how much thought he put into the workings of such a science. Benford’s handling of Hari Seldon is just as impressive. Benford adds additional layers to Hari’s character that are completely consistent with what we already know of him, and he also manages to allow Seldon to experience the growth and change that you expect a novel’s major character to undergo. Considering that Asimov had already defined the character in many ways, such an achievement is no small matter. Although Benford does a great job of providing pertinent information to those completely unfamiliar with the series while keeping the exposition down to a more than tolerable level, it seems that it would be difficult to read this novel as a standalone. It almost goes without saying that your enjoyment of the novel will increase proportionally with the degree to which you’re familiar with the Foundation universe. Furthermore, the novel is being marketed as the beginning of a second Foundation trilogy-Harper Prism definitely doesn’t want you to think that it is a meant to be a standalone. However, this book doesn’t feel like the beginning of a trilogy; Benford leaves no visible loose ends, thus giving the novel a definite closure you don’t expect from the beginning of a series, and there’s a dearth of clues in the book as to what the second installment might be about. Nonetheless, Benford insists that themes from Foundation’s Fear will thread through the next two books. This closure is definitely a good thing. Without it, I for one would feel manipulated into picking up the next volume when it comes out. Thankfully, such an issue is a moot point. Although it is neither groundbreaking nor a work of importance, Foundation’s Fear is a good story that provides a lot of fun, even if, perhaps, Benford took too many liberties with Asimov’s universe. This entry was posted in Book Review, Gregory Benford. Bookmark the permalink.